107 Heronswood Road (top left flat) from the back, 1956. 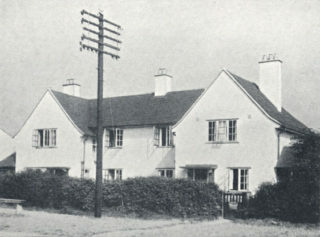 13 Heronswood Place (2nd door from the left) pictured in 1940. 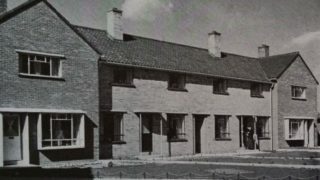 My sister Mary's house at 6 Beehive Lane (furthest from camera), 1952. My first house, 4 Two Acres (home on the right), in 1957. Mother & Father, Thomas Arthur & Jane Alice Osmond, were both from the Easington area of County Durham in the north and had married in 1925 and then had my sister Mary in 1926. Father worked in the mines when they lived up there, and renting one room in a generally awfully decorated terraced house in the area known locally as ‘Miners Haven’ which was the poorest area of Easington where people lived in slum-like conditions and couldn’t afford much. Mothers didn’t work then, so my mother was a housewife looking after my big sister. They both were in desperate need of alternative employment & most importantly alternate housing as my sister Mary was suffering badly from bronchitis come January of 1927. Mum & Dad then travelled about 400 miles to the town of Letchworth Garden City that February and Father worked in the steel factory where the workers were given health insurance for all the family, so my sister was cured within a month. They lived at 66 Nevells Road back then. After Dad lost his job in February 1928 they decided it was time to relocate once again, and they headed to Welwyn Garden City. As I stated above the next & last port of call was Welwyn Garden City in early February of 1928. 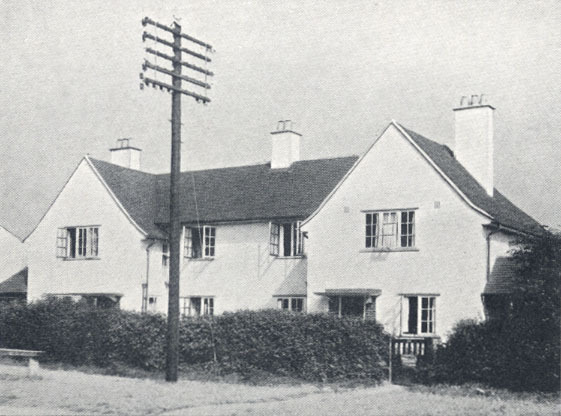 Mother and Father first lived at 39 Handside Lane which was a three/four bedroom, two bathroom council house and Father worked for Shredded Wheat where he worked until 1935 when he went to British Lead Mills until retirement in 1966. 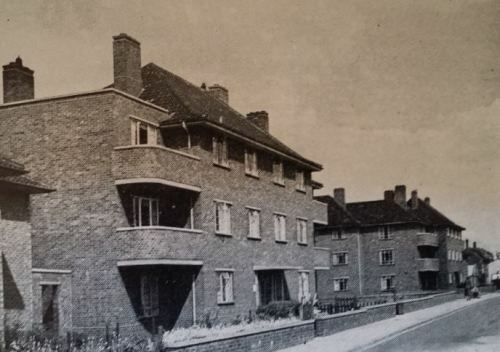 As the Garden City’s east side continued to develop they were then housed at 13 Heronswood Place (off Heronswood Road) which was a small three bedroom council property but it fitted their needs. I was then born in 1937 at the home. The home had one master bedroom and two small bedrooms with one downstairs bathroom, adequate sitting room and a small kitchen but it was convenient. Long garden I do recall. My sister Mary attended Peartree Primary School (1931-1932) and then Ludwick Infant School (1932-1934) and then to Parkway Primary School (1934 – 1937), then she passed the Eleven Plus examination and went on to Hertford High School (Simon Balle School now) from 1937 to 1942 where she took her Schools Certificate exams and passed, and then started work. I attended Ludwick Infant School (1942 – 1944), Peartree Primary School (1944 – 1948) and then to Handside Secondary School (1948 - 1952) and then began work. Mum initially was a housewife in Easington & Letchworth, and then when Mary started Peartree School in 1931 she went to work for Beieisdorf Ltd on Bessemer Road and then in 1939 to Dawnays and then in 1951 to Dolcis (shop on Howardsgate). In 1956 she went to work for Roche Products Ltd, 1961 to ICI and then 1963 to Smith Kline & French until she took retirement in 1966. I remember she did cleaning work for Beieisdorf, and at Dawnays she worked melting steelwork and then as a shop assistant for Dolcis, and then in Roche & ICI a data entry clerk then at SKF she was a cleaner and then retired when she got fed up of employment. My parents were at 13 Heronswood Place until when I was 13, and then they were re-allocated a prefab on Wellcroft Road (1950), which had two bedrooms and every appliance a normal concrete house did have. They were there for three years, and then moved to 107 Heronswood Road when The Howard S.M. School opened. 107 Heronswood Road was a top floor, two bedroom flat and my parents loved their flat they had!!!! Father sadly died in the flat in 1975, and Mum did die in the flat in 1989. Best parents and best childhood ever! This page was added on 06/02/2016.